Are you caring for a loved one who suffers from dementia? You may have noticed changes in his or her sleep patterns as the disease has progressed. Scientists do not completely understand why dementia affects a person’s sleep cycle, but due to dementia’s major effects on the human brain, a significant percentage of sufferers experience sleep disturbances. Dementia is characterized by cell death and tissue loss in the brain, causing the brain to shrink and impeding its functions. The cortex, the part of the brain associated with thinking, and the hippocampus, an area of the cortex associated with the formation of memories, experience a dramatic loss in size. Meanwhile, the ventricles, which are the hollow cavities in the brain that fill with fluid, increase in size. Unfriendly plaques and tangles build up in a brain with dementia and may be the cause of the cell and tissue death. Tangles can devastate an important cell transport system made up of proteins. In a healthy brain, proteins keep food molecules and other vital materials on track to their destination, but in a brain with dementia, these helper proteins collapse into tangles that no longer regulate the transport system. Because they can no longer receive nutrients, the cells eventually die. The changes to a brain with dementia affect all areas of life, including sleep. Although these changes are generally more apparent in later stages, they may also become noticeable in earlier stages. Difficulty Sleeping. Sufferers may take longer to fall asleep, wake frequently during the night, and disturb those around them when they wake up confused. They spend less time in both dreaming and non-dreaming stages. Daytime Napping. Shifts in the sleep-wake cycle may result in people with dementia feeling tired during the daytime but unable to fall asleep at night. If a person spends a significant amount of time lying in bed awake at night, they are likely to spend much of their day napping. Nighttime Wandering. It is common for people with dementia to wander away, which causes stress for caregivers who must constantly be on their guard. If a person with dementia has a confused sleep cycle, this wandering habit can take place in the middle of the night. Sleep-Disordered Breathing. When a person snores at night, the long, loud breaths are punctuated with periods of no breathing. Depending on the severity of the breathing disorder, a person may stop breathing many times per hour, interrupting the flow of oxygen to the brain. Studies suggest a connection between snoring and memory-loss, resulting in a condition called Mild Cognitive Impairment. Sundowning. A syndrome that affects many sufferers of dementia, sundowning is characterized by mood swings later in the day. A person feels happy and calm during the day until around 4 pm, when they become angry or aggressive. They may yell or pace, and they have trouble calming down enough to sleep until late at night. Whether medical or environmental, it is important to identify the causes of sleep changes. Speaking with a medical professional may aid you in your search for sleep relief. It is particularly crucial to identify the causes for difficulty sleeping with sufferers of dementia, as they may not be equipped to identify the problem themselves. Depression. Depression, for which the symptoms include apathy, isolation, and difficulty concentrating, is incredibly common among those suffering from dementia, particularly in the early to middle stages. Although depression in dementia sufferers does not always manifest the same symptoms that it does in non-dementia patients, it may result in sleep disruption. Treating depression in people with or without dementia requires serious attention. Restless Legs Syndrome. Restless Legs Syndrome is classified as a sleep disorder because periods of rest or sleep trigger its symptoms. When a person suffers from this disorder, uncomfortable sensations in the legs occur creating an overwhelming desire to move them. The uncomfortable sensation subsides when the subject walks around but then resumes when he or she tries to lay down again. Because the disorder makes it so difficult to sleep, most sufferers of Restless Legs Syndrome are drowsy and irritable all day. Sleep Apnea. A serious sleep disorder, sleep apnea is a common cause of snoring and results in temporary pauses in breathing that occur many times during the night. This means the brain is not receiving enough oxygen and raises a person’s risk for depression, diabetes, heart problems, and stroke. There are two kinds of sleep apnea: Obstructive Sleep Apnea and Central Sleep Apnea. The former is caused by a physical blockage of the airway, and the latter results when the brain does not tell the muscles to breathe. Urinary Tract Infections. Often caused by the presence of E. Coli or other bacteria in the urinary tract, urinary tract infections are unfortunately quite common among women, and they can also affect men. UTIs are known to cause a persistent desire to urinate, which disrupts the sleep cycles and sends sufferers to the bathroom in the middle of the night. Confusion After Dreaming. People with dementia may become disoriented when waking during the night, as they have difficulty differentiating between dreams and reality. If they wake from a dream that took place during the day, they may assume that it is still daytime and get out of bed, even though it is the middle of the night. Less Need for Sleep. Many elderly people require less sleep than younger people. This may result in them waking up with greater frequency during the night. This is due to the death of regulatory neurons associated with regular sleep patterns in aging bodies. An Upset in the Body’s Circadian Rhythm. Many older adults feel less satisfied with their sleeping habits, due to changes in their circadian biological clock. This body system tells us when we should be awake and when we should fall asleep, triggered by cues sent from the body and from light and dark conditions outside. For this reason, many elderly people sleep quite early in the evening and wake much earlier in the day. Dementia can exacerbate this bodily confusion about sleeping and waking hours as it damages the brain. Although no one solution will be a cure-all for sleep problems, there are ways to alter the sleeper’s environment that may help ameliorate the situation. Create environmental cues to signal waking and sleeping hours. During the day, this means exposure to bright light. People with dementia should spend at least an hour outside in order to be exposed to the sun’s light. If their physical condition makes going outside for this length impossible, bright light therapy with specially designed lamps can serve as a substitute. At night, you may consider putting blackout curtains in the bedroom where a person with dementia sleeps to prevent outside lights from sending confusing signals about the time of day. Other people in the house should avoid making noise. Furthermore, a clock near the bed that clearly indicates the time of day and whether it is day or night can help guide a confused person who wakes during the night. Create a comfortable sleeping environment. Temperature, bedding, and sound are all important for ensuring the sleeper get the best possible rest. Make sure the room where they are sleeping is not too hot or too cold and their bedding is clean and comfortable. In addition, outside noise can have a big impact on sleep quality. If you live in a noisy area, consider installing a white noise machine to cancel out distracting sounds. Finally, you may wish to install night lights to guide the person to the bathroom, should they wake in the middle of the night. Establish a consistent routine. To aid the body’s natural circadian rhythm, establishing a set wake-up time and bedtime can create better sleep habits for people who struggle with sleep problems. It is particularly important to establish a set wake-up time, as this will allow the body to fatigue naturally in time for bed in the evening. Increase outdoor physical activity during the day. 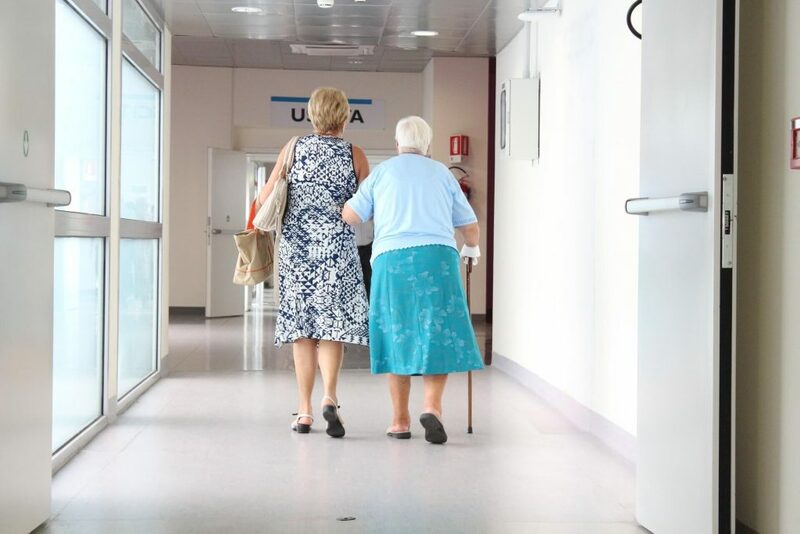 Taking a person with dementia for a walk outside is doubly effective in combatting sleep dysfunction: an outdoor walk both gives a person a chance to use their muscles and expend energy, and it increases their exposure to sunlight. These activities in tandem help a person feel naturally tired at the end of the day and stabilize his or her internal clock. Regulate your loved one’s diet. Caffeine and alcohol both negatively affect the quality of sleep, especially if consumed in the hours before bedtime. Caffeine makes a person more awake and alert. Furthermore, studies suggest that alcohol impedes the restorative functions of sleep. Large, sugary meals before bedtime can also make it more difficult to fall asleep. As with anyone, a healthy diet results in a healthier person, and it can be particularly critical to avoid certain unhealthy foods in the cases of dementia patients. They should also avoid nicotine, which is another stimulant like caffeine. Install a nighttime monitor. For your peace of mind, installing a monitor in the room of a sleeping loved one with dementia can let you know whether they have woken. If he or she has woken up and is confused about the time of day, you should discourage them from lying in bed awake. Make sure the bed is associated with sleep. Likewise, discourage them from watching TV during these nighttime episodes. If all else fails to help a dementia patient sleep well, you may consider sleep medications. However, be aware that sleep-aids carry with them a considerable risk and should be used as a last resort. The risks include an increased chance of falling and subsequent bone fractures, increased confusion, and a further decline in the ability of the person to take care of him or herself. If a person establishes a healthy sleep pattern through using sleep medications, it is then healthiest to try and ween them off the medication. A doctor may prescribe a drug based on the behaviors which accompany the sleep disturbances. Common medications to help cognitively impaired older adults achieve healthy sleep patterns are antidepressants, benzodiazepines, nonbenzodiazepines, and antihistamines. Doctors may in some cases prescribe antipsychotics, although the risk of serious negative side effects is high. The FDA recommends seeking other treatments over the use of this kind of drug. Benzodiazepines and nonbenzodiazepines. These medications are a type of sedative-hypnotic agent and doctors frequently prescribe them for short-term treatment of unhealthy sleep patterns. Benzodiazepines increase total sleep time while decreasing the amount of time spent in shallow sleep stages. Like all sleep aids, there is a risk of side effects like increased drowsiness, confusion, and forgetfulness, particularly in older adults who suffer from dementia. Newly developed benzodiazepines may have fewer side effects, but because of their newness, researchers lack the data to know for certain. Antidepressants. Often prescribed when doctors believe irregular sleep patterns to be a byproduct of depression in older adults, antidepressants are effective in inducing healthy sleeping habits. However, negative side effects in elderly dementia patients include drowsiness, sedation, dizziness, and weight gain. In this category, doctors most commonly prescribe selective serotonin reuptake inhibitors. Antihistamines. Most over-the-counter sleep aids contain antihistamines, and doctors often prescribe them to elderly dementia patients. Antihistamines work against naturally occurring histamine produced by the central nervous system. However, users of antihistamine develop a tolerance quickly, and its sedative effects may not last long. Moreover, antihistamines trigger many negative side effects in older adults, such as drowsiness, confusion, hallucinations, urinary retention, and others. Because of these side effects, their prescription is not usually recommended. Dementia takes a serious toll on those whom it afflicts and on that person’s caregivers. Making sure that a dementia patient gets a good night’s sleep can offer some peace of mind to everybody involved. As sleep disturbances in dementia patients are quite common, a physician will most likely be able to advise you on how to increase the length, consistency, and quality of sleep. Oftentimes, changes in the environment and behavioral habits will be enough to improve sleeping patterns, and patients can avoid riskier medical solutions.